Five for you this week! Day 229 – Pink: Pink is not my color, blue is. My home is decorated with lots of blue and I have a lot of clothes that are blue. It is hard for me to find pink things around my home. It was getting to the end of day and I remembered that I still needed to capture a photo from my day. A cloud filled evening sky usually has some shades of pink, so I stepped outside and saw this lovely summer evening sky with just a few shades of pink. Perfect! Day 230 – Measured:Pinterest is a wonderful way for me to store recipes that I want to try (I even have a whole board devoted to recipes I would love to try!) No more piles of clippings from magazines collecting dust in my home. But every now and then, there is a recipe I find that sits on my counter just begging me to give it a try. And since I had just about all of the ingredients at home on this summer day, I decided to make it! 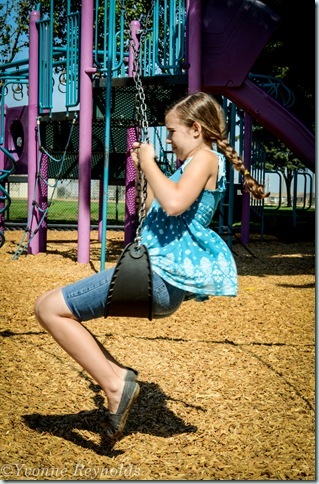 Day 233 – Spin: Kelsey and I were meeting a young mom from church at one of our local parks. Since I knew they had swings, I just had to bring my camera along! She wasn’t spinning too quickly, so I knew I didn’t need too fast of a shutter speed to freeze the motion. This was my favorite one out of the bunch. I love how her braid is ‘flying’ out away from her. And I love that my 13 year old daughter is not ‘too old’ to swing for me. Day 234 – Abundant: Kelsey and I were able to spend the whole day with friends up in the foothills today. My friend and I were able to talk all day long while the girls played, chatted, swam, and made fun videos. It was a wonderful day! On the way home, I knew I wanted to capture the sunset. We pulled over a couple of times to get just the right shot. I love the sun flares on this one. Day 235 – Local Landscape: As I have mentioned before, there are some days when we just stay home all day long. I could have driven around town to find something away from our home to photograph for this prompt, but why not take a picture of my own backyard since it is part of my local landscape and a place I enjoy spending time. Especially reading over in those red chairs with my iced coffee. Have you started to Capture Your 365 yet?